Not all real estate licensees are the same; only those who are members of the NATIONAL ASSOCIATION OF REALTORS(NAR) are properly called REALTORS. They proudly display the REALTOR® trademark on their business cards and other marketing and sales literature. REALTORS are committed to treat all parties to a transaction honestly. REALTORS subscribe to a strict Code of Ethics and are expected to maintain a higher level of knowledge of the process of buying and selling real estate. An independent survey reported that 84% of home buyers would use the same REALTOR again. Real estate transactions are one of the biggest financial dealings of most peoples lifetime. Transactions today usually exceed $250,000. If you had a $250,000 income tax problem, would you attempt to deal with it without the help of a certified professional accountant? If you had a $250,000 legal question, would you deal with it without the help of an attorney? Considering the small upside cost and the large downside risk, it would be wise to work with a professional REALTOR when you are selling a home. REALTORS® Know How to Navigate the Process – A REALTOR® is the manager of your home buying process. Nicole explains that you and your REALTOR® will begin with extensive discussions to head off any road blocks later on. 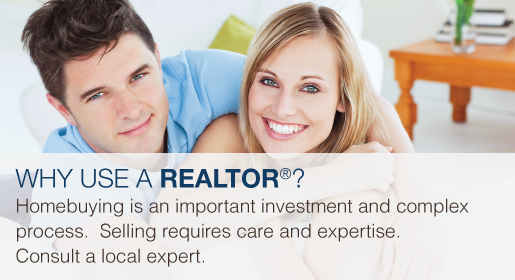 Your REALTOR® is aware of your concerns, needs and priorities. They are there from the beginning to end, navigating each step of the way with you. Selling real estate can be a tricky business, full of regulations and involved steps. Your REALTOR® works for you, staying on top of the latest regulations and helping you meet them. REALTORS® Know How to Professionally List the Property – In the age of Web 2.0, it’s not enough to upload your phone photos to a few random sites. Buyers expect professional grade photos, videos and flawless online presentation. To get the most exposure, you also need to manage your listing across multiple channels. REALTORS® will do all this for you, including coordinating with photographers and videographers to make sure your listing is top-notch. Hitting the right emotional and responsive chords with buyers is the goal, your Realtor will help you determine who the likely audience is, and market directly to that target group. Your REALTOR® can recommend repairs or cosmetic work that will significantly enhance the saleability of your property – Before you list, your home must be in the best condition possible. Your REALTOR® can advise you on what repairs need to be made, and they frequently know good reputable contractors who can help. A REALTOR® will help assess the situation, and advise you not only on repairs but also on staging your home. Staging is extremely important, first impressions are vital. Not only do all of the repairs need to be done, but the property must be show ready, this means maintaining curb appeal, decluttering, staging furnishings and décor, and thoroughly cleaning the property. The home must be open and inviting, temperature, odors, pets and lighting must all be taken into consideration. Your REALTOR® may also advise you to de-clutter certain closets and rearrange rooms. They may explain which personal touches add a “trendy” and/or “homey” look buyers are currently looking for. REALTORS® Know the Area – The key to a good agent is knowing the area. They know what the property values are, and have a good idea of future market fluctuations. They also know where and how to list your property for best results, ie selling your home for top dollar in the shortest time possible. Having a home listed on MLS and a sign in the front yard is not enough. A good REALTOR® that is knowledgeable of the area is essential to getting the best deal on your home. REALTORS® Can Help Get Buyers through the Doors – REALTORS® not only get the market a home to generate interest and traffic in, but they know how to manage it. They can arrange and hold open houses in a way that gets as many visitors as possible. They also work with buyers and their agents so that showings are more convenient for you. This is especially important if you still live in the house. REALTORS® may also help weed through potential candidates so that you don’t waste your time with no-shows or non-serious buyers. Your REALTOR acts as the marketing coordinator, distributing information about your property to other real estate agents through a Multiple Listing Service (MLS) or other cooperative marketing networks, open houses for agents, etc. The REALTOR Code of Ethics requires REALTORS® to utilize these cooperative relationships when they benefit their clients. Your REALTOR will know when, where and how to advertise your property. There is a misconception that advertising sells real estate. NAR studies show that 82% of real estate sales are the result of agent contacts through previous clients, referrals, friends, family and personal contacts. When a property is marketed with the help of your REALTOR®, you do not have to allow strangers into your home. Your REALTOR® will generally prescreen and accompany qualified prospects through your property. Your REALTOR can help you objectively evaluate every buyer’s proposal without compromising your marketing position. This initial agreement is only the beginning of a process of appraisals, inspections and financing and a lot of possible pitfalls. Your REALTOR can help you write a legally binding, win-win agreement that will be more likely to make it through the process.